I make no apology for reprinting this book review of The Olive Oil Diet which was published in the internet magazine Medscape. It was written by Dr. Melissa Walton- Shirley MD, a US cardiologist. In it she sums up everything that my co author, Dr Simon Poole, and I were trying to convey. “If you observe Simon Poole, British nutritionist and family physician, sitting down to lunch, you might be surprised to spot a shiny hip flask peaking from underneath his jacket. Watch as he politely thanks the server who sets the salad before him. He will then reach into his pocket, retrieve the flask, and unscrew the lid. By this time, your eyebrow is raised as you anticipate him indulging a quick snort of Wild Turkey bourbon. Instead, he splashes his salad generously with the highest-quality extra-virgin olive oil on the planet. It’s proof that Simon doesn’t just talk olive oil; he eats, drinks, and lives it. That passion turned obsession prompted him to cowrite a book with acclaimed food writer Judith Ridgway, titled The Olive Oil Diet: Nutritional Secrets of the Original Superfood (London, UK: Little Brown, 2016). I’ve communicated with Simon several times over the years after seeing him speak at the European Society of Cardiology. I wrote “Imagine our world if we taught it how to eat” after that presentation. I reviewed this book because the practices it promotes can improve health and drive down the cost of healthcare (I have no disclaimers). Don’t be fooled by the title; the authors are careful to point out that you can’t pour olive oil on a hot fudge sundae and expect great results. There are seven pillars of the olive-oil diet that include the importance of eating color and the need for varied protein sources (grains, beans, poultry, dairy, and fish), among others. The book is an easy read and practical, containing daily menus and suggestions for snacks and recipes. It goes into a bit of history, paying homage to the late Prof Ancel Keys, who coined the phrase “Mediterranean diet” and lived to 100 years of age. 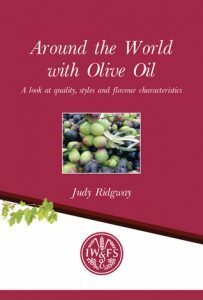 There is a concise explanation for why the book includes the specific recommendation of eating 20 to 70 mL of extra-virgin olive oil per day rather than following the typical menus of Southern Italy, mainland Greece, and Crete. The authors write that the diet should include fresh ingredients, low levels of meat, very few simple carbs, and a reduction in refined sugars. Emphasis is placed on “the culture of taking time to enjoy the food” that is the antithesis of the American ritual of sitting in long lines at the local drive-through to purchase highly processed entrees devoid of fiber and nutrients paired with 100 g of refined sugar in a Big Gulp that we call a “soft” drink. No one who follows the recommendations of Poole and Ridgway will be supersized. The recommendations to adopt this diet are data driven, with multiple excellent references. 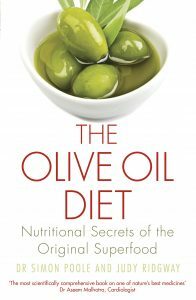 There are quotes from the 2011 study from the Netherlands suggesting that nonsmoking women of a healthy weight who adopt a Mediterranean diet along with regular exercise might enjoy 15 more years of life.Then there is the description of the Spanish subset of the EPIC study that suggest that for every tablespoon of extra-virgin olive oil consumed per day, there is a 13% lower risk of dying from heart disease. Poole and Ridgway also cite potential benefits in cognitive performance,[3,4] among other things. I particularly enjoyed the explanation of how olive oil is graded and what happens when it fails the rigors of testing. I learned that the definition of “extra virgin” is a free acidity level (in the form of oleic acid) that must not exceed 0.8 g per 100 g paired with “fault-free aroma and flavor.” I’d never heard of the International Olive Oil Council (IOC), which set forth the regulations for processing and labeling. I didn’t know that “the human nose can detect rancidity at concentrations as low as 1:10,000 dilution,” besting chemical processes. I learned that basting with extra-virgin olive oil has been found to reduce the harmful heterocyclic aromatic amines created during the browning process that have been linked to cancer.I now understand that I should store my olive oil in a tin container instead of glass or plastic to avoid the harmful effects of natural light. The book includes recommendations for healthy eating such as eating nuts without salt “that still have their outer husk” and getting our sweets from honey and fruit rather than refined sugar. Much of this isn’t intuitive in America, where many adults forage daily for what they want instead of what they need because we lack basic nutrition education, a survival skill not readily available in schools. Of course, not everyone is convinced that olive oil is nectar from the gods. Dr Lawrence Rudel and colleagues at Wake Forest University in Winston-Salem warn that the science supporting claims that monounsaturated fats are heart protective is weak since it’s based largely on population studies, rather than randomized controlled trials. He and others note that the benefits of the Mediterranean diet may be tied to the antioxidant-rich foods rather than olive oil. [7,8] I propose that Americans don’t even know the definition of monounstaturated and since our diet is so poor any effort to improve is better than none.